Is there something about this part of the Aegean that causes visitors to focus on the spiritual? There must be, because for thousands of years Delos, at the center of the Cyclades, was celebrated as a sacred island. It housed many temples and was host to various religious festivals during the calendar year. In our day, the center of spiritual life in the Cyclades, and arguably the most significant locus of worship for Greek Orthodox Christians (and an important place for Catholics as well), is this arrowhead-shaped, northwest-pointing, much larger island just 15km north of Delos and still at the approximate center of the Cyclades. Thousands of the faithful make their pilgrimage here every March 25th and August 15th. On those dates, two of the most important on the calendar for the Orthodox, the Annunciation and the Dormition (or Assumption) of the Virgin Mary are celebrated. The Annunciation, 9 months before Christmas, is the traditional date of the visitation of the Virgin Mary by the angel Gabriel as found in the Gospel of Luke, chapter 1:26-38, announcing to her that she would give birth to the Savior of the world. The Dormition, known here as Dekapendavgousto ("15th of August") is the traditional date of the death of Mary and of her subsequently being taken up to heaven. In addition to the 3 S's that you find on the Greek islands- sea, sun and sand- Tinos offers some things very unique: there are the gigantic crowds coming on the two aforementioned dates, there are many gifted sculptors who make their home on Tinos, there are its 80 windmills, and there are the approximately 1,000 beautifully ornate dovecotes- sort of high rises for mourning doves and pigeons- to be found decorating the countryside. We'll look at all of these things, in addition to the usual 3 S's. 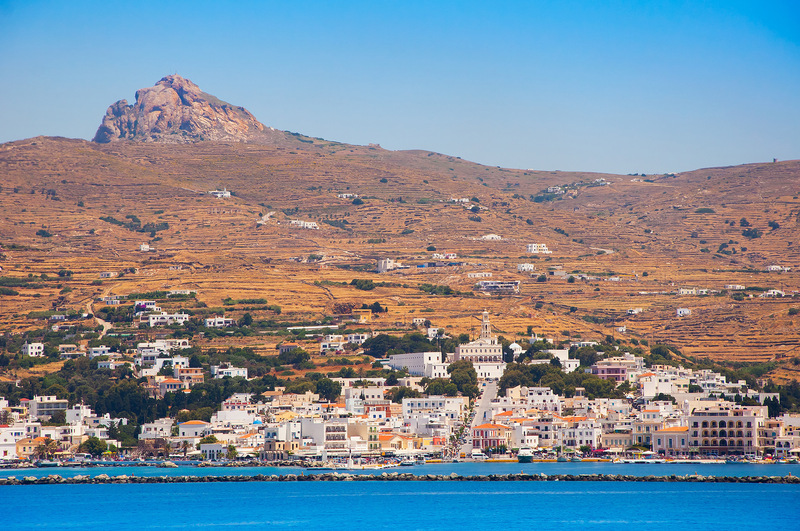 About 9,000 people make Tinos their year-round home. Because of its Venetian past, Catholics and Orthodox Christians share this island. The island is located near the geographical center of the Cyclades island complex, and because of the Panagia Evangelistria church, with its reputedly miraculous icon of Virgin Mary, Tinos is also the center of a yearly pilgrimage that takes place on the date of the Dormition of the Virgin Mary (August 15th). Tinos was known in antiquity as "Ophioussa (Snake Island)" because the place apparently was crawling with snakes, and "Ydroussa (Water Island)" because it had abundant water. Poseidon, the island's patron god in antiquity, is supposed to have removed the snakes. (The island is still relatively well-watered.) A sanctuary dedicated to Poseidon was erected at Kiona, just a couple kilometers up the coast from Tinos Town, the main port. Interestingly, Tinos was the only island in the Cyclades where Poseidon was worshipped and a temple honoring him was built. Even more interesting, it's the only place where Poseidon was worshipped as a healer. 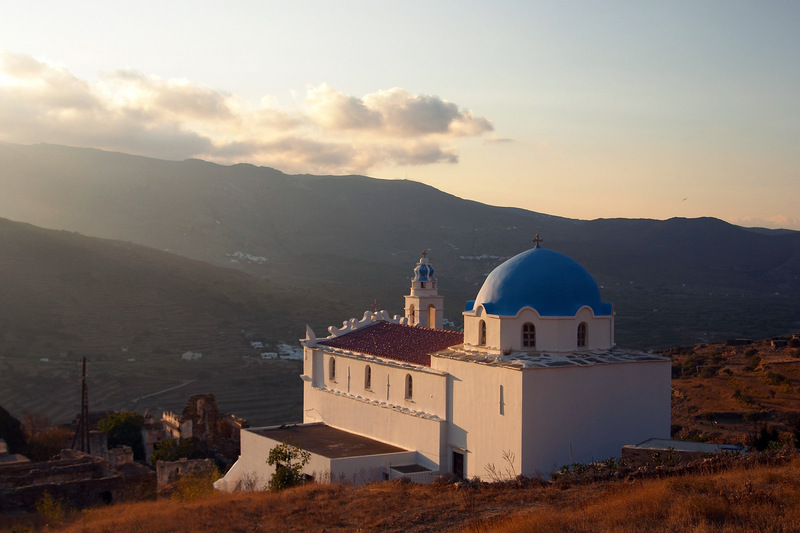 Currently, Tinos is home to the famous icon of the Virgin Mary that is also said to have healing properties. In mythology, Tinos figures in both the tale of Jason and the Argonauts, and in the Odyssey. 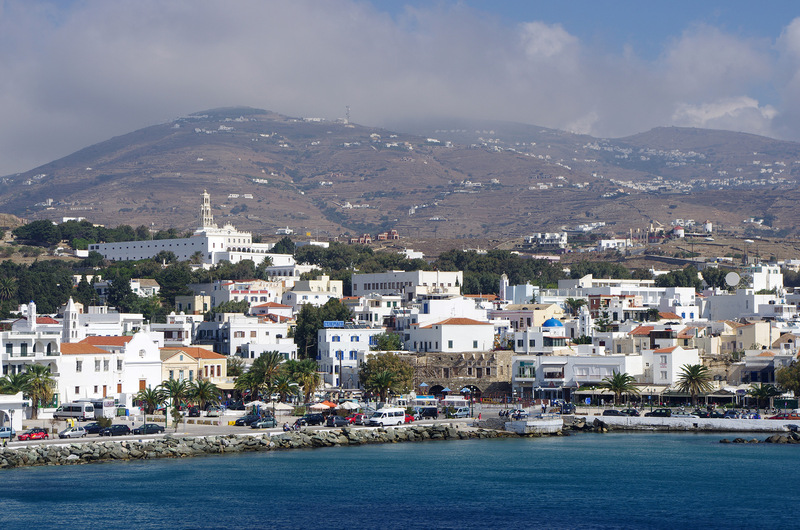 Tinos was possibly first settled by Phoenicians. Later, in the 11th century BC, the Ionians (Greeks from what is now the western shores of Turkey) took the island. Another theory of the early settlement of Tinos has the Ionians coming much earlier, and the island taking its name from their king, Tino. The classical Greek writer of comedies, Aristophanes, nicknamed Tinos "Skordoforos (Garlic-bearing)," because it produced top quality garlic. A contemporary nickname for Tinos is "Nisi Aeolou (Island of the North Wind)" because of the strong prevailing northerlies. In the 2nd century BC Tinos, and the rest of Greece, became part of the Roman empire. During the early Byzantine empire (the Greek-speaking eastern successor state to Rome), Tinos's residents moved inland from the coasts to protect themselves from the constant pirate raids which were a scourge throughout the Mediterranean during this time. The Venetians were the next rulers of Tinos, in 1207 AD. The island flourished under Venetian rule, and was able to thwart the Ottoman Turks' designs of conquest of Tinos until 1715. Tinos was one of the last acquisitions by the Turks in the region, and their rule lasted only for about 100 years. In 1821 Tinos joined the general Greek revolt against Ottoman Turkish rule, and when Greece once again became an independent state in 1832, Tinos formally allowed herself to be annexed to Greece. Tinos is one of those islands habitually overlooked by the casual tourist. After admiring the long coastline of Tinos, the casual tourist's ferry docks at the port. He enjoys the view of the port during his brief layover, the boat's horn blasts, the anchor is weighed, and off he heads to his main destination elsewhere, usually Mykonos, which is on the same ferry line. If he had chosen to disembark and spend a few days on Tinos, he most likely would never had regretted his decision. Tinos has some great beaches, and a lot of interesting features, some of them unique to other islands in the Aegean. Take those dovecotes and windmills, for example. Dovecotes are found elsewhere in the Cyclades, but Tinos takes the prize for number (around 1,000) and complexity of design. The Venetians started building them in order to attract pigeons, which they would eat, and then use their droppings as fertilizer. The dovecotes can be quite large and elaborately designed, with the lower story used as tool rooms, and the upper parts partitioned by the square entrances of the pigeons' homes. The cotes are built of whitewashed, plastered stone, with raised, brown-colored slate Cycladic-style geometric designs (squares, triangles, suns and cypress trees) decorating the upper portions. Many of them date from the 17th-18th centuries, and many are now empty but in good repair, sitting on the edge of uncultivated fields. The existence of the dovecotes and the use of the birds' droppings for centuries now have made Tinos one of the greenest islands in the Cyclades. The unique look of the dovecotes has proved to be popular enough that many modern homes on Tinos have mimicked their architectural style. Another feature of the Tinian landscape that was affected by Venetian rule is the presence of hundreds of windmills, which were usually built at the sides of thoroughfares and crossroads to facilitate transportation of raw wheat, and ground flour. These cylindrical, whitewashed buildings, most of which no longer have their sail-like fins, none of which are currently operational, usually are 3-stories high, with the attic housing the cogs, wheels and stones of the mill itself, which required a great deal of skill to make. The mills came into valuable use during times of war, such as the Greek Revolution (1821-32), when flour became a scarce and vital commodity. During WWII the Nazis forbade the use of the mills on the grounds that Greeks were supposed to feed the occupiers, but not themselves. Millers would work late at night grinding grain to feed the islanders, putting their own lives at risk for their illegal activity. Some of the mills have been restored and are rented out to lucky vacationers. Tinos also has a strong artistic tradition, especially in marble sculpture, and is home to a number of well-known Greek sculptors, such as Philippotis, Vitalis, Giannoulis Halepas, and Antonios Sohos. In the village of Pyrgos is the home/museum of Giannoulis Halepas (1851-1938), featuring many examples of his work. There are also a many woodworkers, painters, and icon artists . There are a number of galleries and foundations throughout the island displaying their work, with regular public exhibits being held. Pyrgos is also home to the excellent Museum of Marble Crafts. The Tinian Arts Museum, in Tinos Town, is next to the church of Panagia Evangelistria. Much of the work in the museum was underwritten by a foundation sponsored by the church. Other works were donated by the artists, who recognized the value of grants given to various artists. The museum features paintings, sculptures, reliefs, and copies of some of the best-known Renaissance painters. The focal point of this port city is the massive, neoclassical church complex of the Panagia Evangelistria, home to the famous miracle-working icon of the Virgin Mary. The church complex can't be missed: it's a straight 500-meter shot from the ferry port up the town's main street, Leoforos Megaloharis. Mary is both the patroness of Tinos, and of all of Greece. Greece declared her revolution after 400 years of Ottoman rule on March 25th (1821), the feast day of the Annunciation. The name "Panagia Evangelistria tis Tinos," which is the icon's name as well as that of the church, sounds a bit of a mouthful literally translated into English ( "The All-Holy Bringer of Good Tidings of Tinos"), and the icon that gave rise to the church built to honor its image is wedded to the Revolution. The icon was discovered early in the war, in 1823. The icon is also referred to as the "Megalohari ("Great Grace") of Tinos. The story is that Sister Pelagia (now Saint Pelagia), a nun from a the monastery Kechrovouniou, located on the upper slopes of Kechrovouni mountain, 3.5km northeast of Tinos Town, had a vision in which the Virgin Mary directed Sister Pelagia to the spot where the church now is. The nun promptly dug the icon up. How it got there is another story, but it might help to explain that during the Iconoclastic Controversy in the Byzantine Empire is the 8th-9th centuries, the use of icons was hotly debated, and for awhile icons were banned. Those in existence were ordered to be destroyed. So a lot of icons got hidden away, some in caves or clefts in the earth. In this case when the men who did the actual digging brought the icon to the light for the first time, it was covered with a transparent, glass-like shield which, when broken, released the healing power of the icon. The icon is considered to be the work of Apostle Luke. Because it was found early in the Revolution, Our Lady of Tinos was declared the patroness of the new Greek state, and visits forthwith were made by the leaders of the revolution, including general Theodoros Kolokotronis, general Yannis Makrigiannis, and Admiral Miaoulis. The building of the church was the first major construction project conducted by modern Greece, and was completed 2 years before the end of the war in 1832. The image itself is that of the Panagia kneeling and praying over an open book while the Archangel Gabriel stands facing her, holding a lily (symbolizing purity), as a dove representing the Holy Spirit superintends the proceedings from on high. Over the years the icon has been almost completely covered with silver, gold and precious stones. Like Poseidon before her, the Megalohari is considered a healer of the sick and a protector of sailors. Thousands flock to this, the most important shrine to Mary in the Eastern Orthodox world, on the two feast days most associated with her, March 25th and August 15th. The sweep of stairs leading up to the church's entrance has carper runners so that the faithful can, if they so desire, go up the steps on their knees. 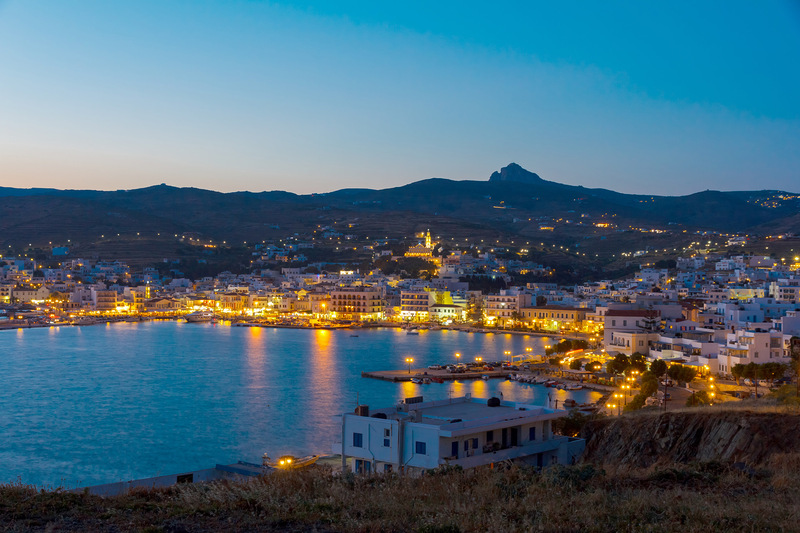 Other than the church and icon, Tinos is a pretty little classical Cycladic village, with its familiar narrow, stone-paved streets, cube-shaped, whitewashed buildings, and splashes of color from various hanging and climbing flower species. This is not a wild nightlife place by any measure, so if that's your goal, you're better off staying on the boat as it heads for Mykonos. But if peace and quiet beauty are your goals, you've come to the right place. There is a nice archeological museum on Leoforos Megaloharis , on your way to the church. It features artifacts from all over the island, especially from the ancient temples of Poseidon and Demeter at Kiona (see below). Tinos Town, unlike most other Cycladic islands, does not have a town beach. The best close beach, and one with the added bonus of having the most important archeological site on Tinos, is at Kiona, just 2km up the coastline from the town. The beach is very quiet, and beautiful, with soft, golden sand and crystalline waters. It is an organized beach with facilities, water sports, sun beds and umbrellas. There are a number of other nice beaches on Tinos, such as Agios Fokas, 2km west of Town, Kolympithra, 14km north of Town, on the north coast, and Agios Ioannis, 5km east of Tinos Town, on the east coast. Kiona was a major center of worship for ancient Greece, and its rise coincides with that of Tinos Town in the 4th century, BC. Its centerpiece are the ruins of the temple to Poseidon, the only such temple in the Cyclades. As is usual with such places, the temple to Poseidon is built on the ruins of a much older place of worship, also dedicated to Poseidon, and a focal point of worship for seafarers who desired safe voyages. The newer temple had sculptures, some of which are found in the museum in Tinos Town, executed by sculptors who were invited to Tinos from all over Greece. The temple was mentioned by ancient historian Strabo, who commented on its size. There was also a sanctuary to Amphitrite, Poseidon's wife, who was considered to be particularly gifted in helping women who could not conceive. I later years the temples were largely dismantled by the Venetians, and their statues and columns were used in other building, such as churches. Four kilometers north of Tinos Town is the ancient citadel of Xomburgo, used as the island's capital and main refuge in the centuries before the focus of the island's life shifted down to Tinos Town in the 4th century, BC. Remains of a Bronze Age settlement have been found among its extensive, weather-worn ruins. Its 650 height is the main feature of the island's landscape that you see as your ferry pulls into the port. Arnados is the highest in elevation inhabited place on Tinos. You can enjoy the panoramic view from its heights, and visit the nun Pelagia's cell at nearby Kechrovouniou Monastery, from which she sallied forth to find the miraculous icon of the Virgin Mary. 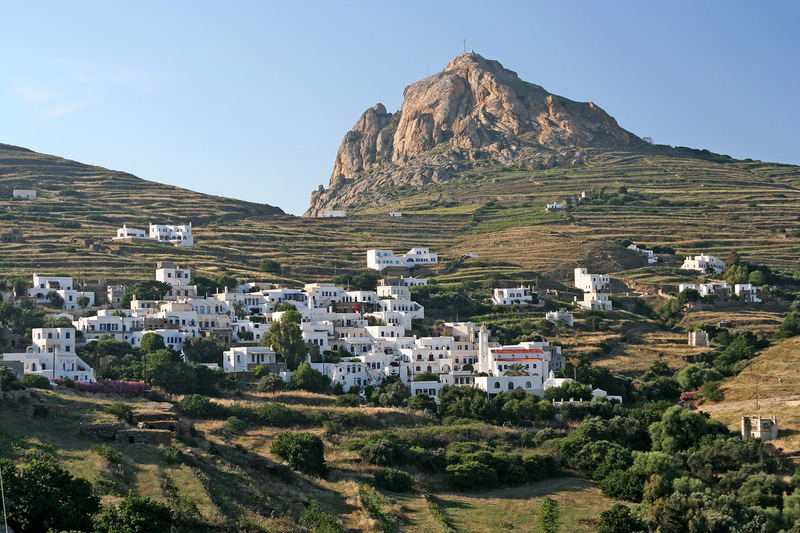 Volax (which sounds a little like the title of a Dr. Seuss book), 6km north of Tinos Town, is noted for being in the middle of a grouping of a field of giant granite boulders and outcrops, some large enough for the villagers to build their houses on top of them. Unique in its religious heritage, fascinating in its archeological history, and different in its artistic tradition, Tinos is a different kind of Greek island, and well worth a visit.